nice project….i also did it and it was awesome only i had to look out for a dark place as the ldr sensitivity was a slight of a problem. i done this project.i realy got good o/p. What can I use instead of the BD139 Transistor?? You can use any other transistor that can drive the relay. So something like SL100 or BC 337 would work? 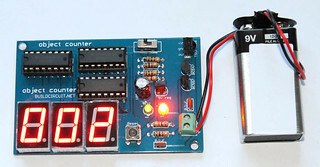 Very good idea and project..i did it as my 3 semester project…but sensitivity is little bit problematic. i have not found any such caculator which has to work as counter. what can i do to use calculator as counter ? Can i replace led & ldr with IR light & IR sensor?